The Los Angeles Lakers showed a lot of promise last season with the young corps of players the team had on the roster then. That group was given decent odds to win the NBA Finals next season at 20/1. Odds like that mean seeing them win wouldn’t be impossible. Improbable? Yeah, but if a few things bounce their way, who knows…. Why? Pretty much because Kawhi Leonard says he wants out of San Antonio. That, and that he would like to play for the Lakers. But Leonard is still under contract with the Spurs and can’t just go anywhere he wants. The Spurs have to be willing to send him to Los Angeles. But it is highly unlikely they’d agree to send him to a team they’d have to beat to make the Finals (should they both make the playoffs). For the last year, the rumor has been that LeBron James could head to the Lakers once he becomes a free agent. There has been some supposed interest in the Houston Rockets. One of his close friends, Chris Paul has been trying to recruit him. But, according to ESPN’s Stephen A. Smith, Paul is now telling people James is headed to Los Angeles. This is just a rumor, of course. With the Cavaliers thinking about throwing their hat in the ring for Leonard, maybe James changes his mind and stays put. Then there is Paul George. The Lakers rumors started for him prior to last season. He told the Pacers he wasn’t going to re-sign and that he wanted to play for the Lakers. Despite the rumors, the Oklahoma City Thunder traded for him with hopes of convincing him to stick around. According to Stephen A. Smith, the Thunder are going to offer him a max contract. Does he want to play in Los Angeles, potentially with LeBron James, enough to pass that up? 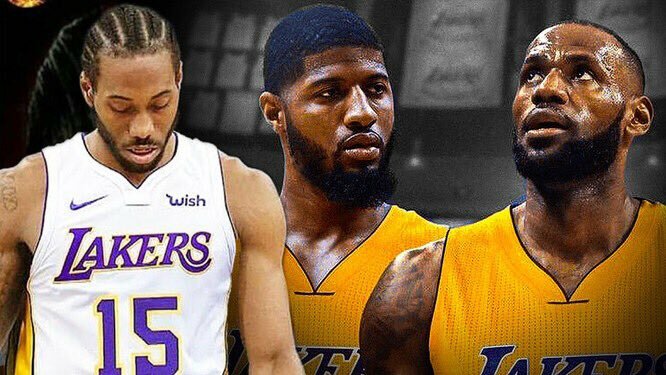 So, while there is a whole lot of talk that could turn the Los Angeles Lakers from a promising, young team into a Golden State-killer, that’s all it is—talk. The odds on the Lakers moved because of nothing more than talk. Now if anything actually comes from all of the talk, then it will become something. But for now, the odds basically moved for no reason whatsoever.